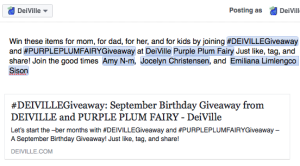 Since September is our birthday month, my dear friend Daryll and I came up with a joint birthday giveaway as a token of thanks to our blog readers and social media followers. We have prepared a simple giveaway for our lucky followers. We hope you can take some time to join as this contest will end by the end of the month. Joining is so easy. Read more for the mechanics. 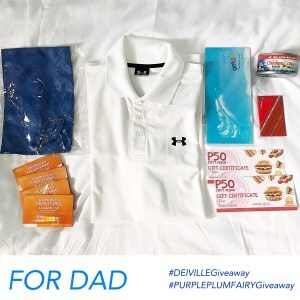 Daryll and I decided to have a specific giveaway for each family members. Hence, we've got something for Moms, Dads, for Women and for Kids. 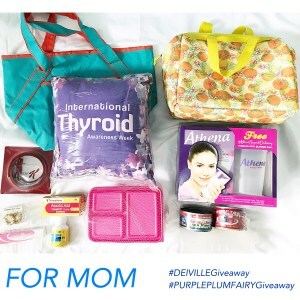 For Mom – 2 boxes of 180 gram Athena milk for women with shaker, 1 thermo lunch bag, 1 foodie container, 1 traveler’s pillow, a pair of accessory earrings, 1 tube Clearascar scar gel, a can of Chicken of the Sea Albacore tuna, a can of Mackerel, 1 red waist belt, 1 bottle Unilab Ceetab Daily ascorbic acid 100 tablets, 1 bottle Unilab Sodium Bicarbonate 100 tablets, 1 sauce dispenser, and 1 green tote bag. For Her – 2 pieces Nikki Minaj top in black and yellow color, 3 pieces Les notes De Lanvin traveler pack – shampoo, conditioner and shower gel, 1 tube Clearascar scar gel, 2 pairs of accessory earrings, 2 sachets Skin Food black sugar mask and black sugar serum sampler, 1 Ulta eye shadow, 1 Michrel S. Barnes broad spectrum SPF 15 sunscreen lip balm, and 1 sachet Myra VitaSmooth moisturizer. 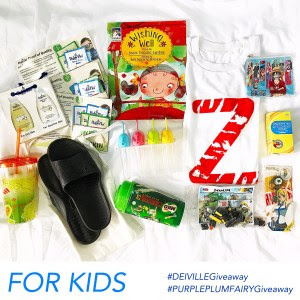 For Kids – 12 sachets Baby Flow oatmeal bath and soap-free bath, 1 “Wishing Well” story book by Anna Pacaña-Lumbao, 1 generic tumbler, 1 Milo tumbler, 1 Zoomanity shirt, a pair of slippers, ice-popsicle molder, 1 bottle Unilab Dizitab chewable tablet 100 tablets, 1 pack Ninja toy, 1 One Piece inspired zipper coin purse, and 1 FairyTail keychain. Read the giveaway guidelines, eligibility and effortless mechanics. By the way, this giveaway is open to all our Facebook page followers only. 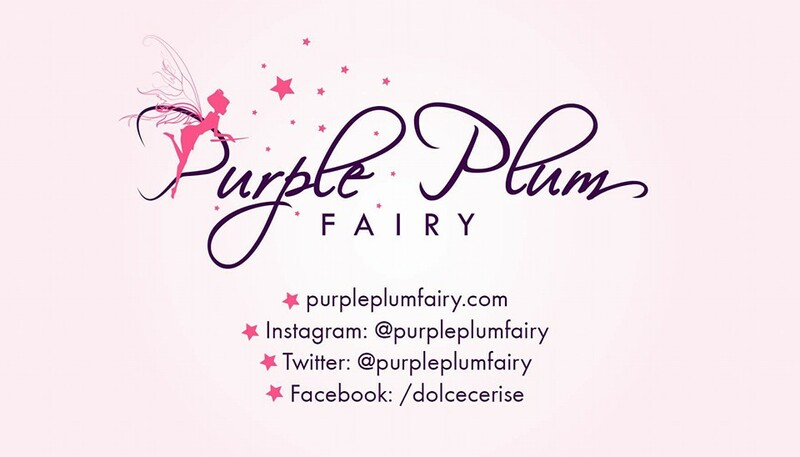 If you aren’t a follower yet, make sure to LIKE our Facebook page respectively Purple Plum Fairy and DeiVille. 1. 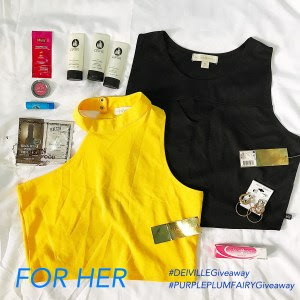 Like and share this post on Facebook with the caption – “#DEIVILLEGiveaway and #PURPLEPLUMFAIRYGiveaway – A September Birthday Giveaway” and tag three (3) of your friends. Please note that your post should set to PUBLIC. 3. Comment on this post with the URL or link to your Facebook share. Remember: One (1) Share is equivalent to One (1) Comment = ONE (1) ENTRY. Avoid spamming facebook, you can share once in a while but don’t OVERDO it! 4. Comment on this post with your user handles for Instagram, Twitter, or Google Plus. Each user handles should be under ONE COMMENT. Remember: One (1) Comment = ONE (1) ENTRY. Hence, should you follow all three (IG, Twitter, and Google+), your comments should be thrice to get the additional three (3) entries. 1. Open to Facebook users who have liked our Facebook page. 2. This giveaway is for followers and fans with Philippine address. 1. 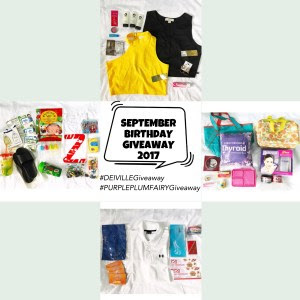 Giveaway will run until September 30, Saturday. Four (4) winners will be drawn on October 4, Wednesday. The result will be posted on our Facebook page. 2. The winners will be notified thru Facebook. 3. This is NOT A SPONSORED GIVEAWAY. 4. 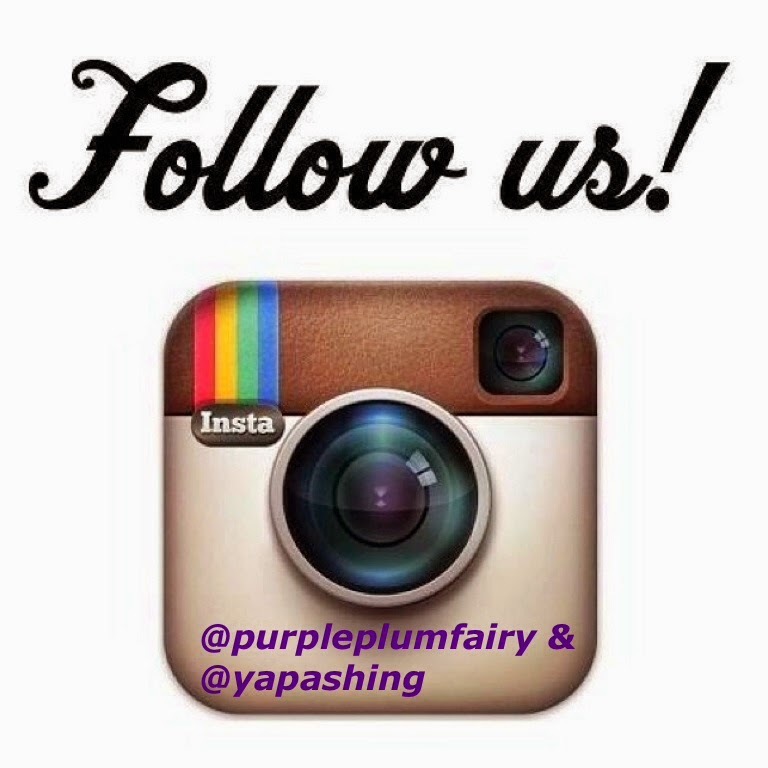 For Instagram users, NO giveaway/dummy//double/business accounts. 5. For Unlikers and unfollowers – will automatically be banned from entering our future giveaways and contests once you unliked/unfollow. Got it? Hope you guys can join!